While we all remember the events like July 1989, June 1995 or June 2011 severe weather events like the one yesterday on June 22nd are far more common. Marginal/modest factors came together to produce sporadic reports of large hail and wind damage. No significant severe weather was reported but we had an impressive cluster of storms nonetheless. At the end of a 3-day heat wave, an approaching shortwave and weak cold front was the impetus for convective initiation. 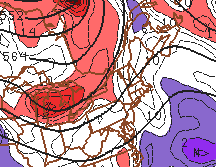 Don’t get too excited about this 00z June 23 500mb analysis! Weak height falls and DCVA created broad synoptic scale lift over southern New England – and was enough to break the cap that had stifled convection the previous two days. Temperatures in the low 90s and dew points between 65 and 70 were enough to overcome the eroding cap and convection fired across the state after 1:00 p.m. Sea breeze boundaries, differential heating boundaries (thanks to advancing mid level cloud deck), and eventually outflow boundaries created a mish mash of thunderstorms across Connecticut. While it was easy to get overwhelmed by the shear (no pun intended) of storms the ones that produced severe weather were easy to pick out on radar. Everything behaved well! Mid level winds remained weak (500mb flow about 30 knots) with 0-6km bulk shear values between 25 and 30 knots during the event. Even with only modest 500-700mb lapse rates MLCAPE values ranged from 1500-2000 j/kg – certainly enough to support severe convection. While most storms were of the ordinary cell variety there were two supercells that developed and several multi cell clusters that lead to a number of borderline severe wind and hail reports. No surprise the majority of the reported damage (and likely all the severe criteria hail and wind reports) came from supercells even though the environment looked somewhat meh for sueprcells. The first developed in the Catskills and tracked through Dutchess County, NY. As should be expected given unidirectional wind profile and straight hodographs the supercell split shortly after moving into Connecticut. 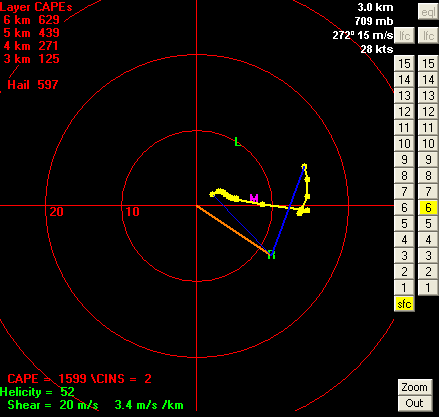 While it wasn’t clear given marginal deep layer shear that supercells would develop the straight hodograph indicates that splitting supercells are favored with neither right or left favored from there (thanks Shabbs). Here is a 3d radar cross section of the supercell shortly it split over Sharon. You can see a hook echo to the south associated with a low level mesocylcone and rear flank downdraft. The core of this storm was dropping some pretty significant hail as well near Cornwall Bridge with 70dbz up to 26,000ft and impressive three body scatter spikes (hail spikes) on ENX radar (not shown). Wind damage was reported in Kent south of the storm and that was likely due to 40-50 knot winds in the storm’s rear flank downdraft. In fact damage was widespread enough that Macedonia State Park and Kent Falls State Park were closed due to tree damage. The right moving supercell died a quick death shortly after its RFD developed as low level shear was insufficient to keep the RFD from choking the storms updraft. 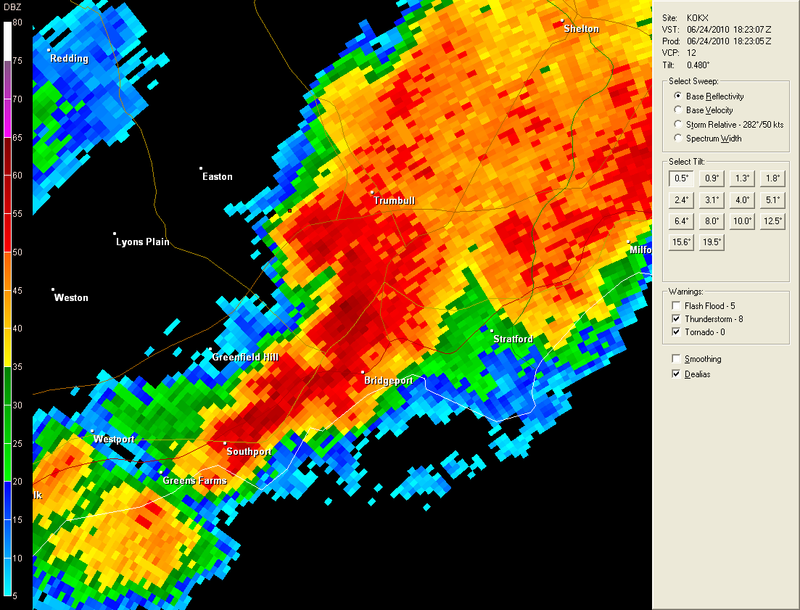 The left moving supercell strengthened a bit as it moved toward Torrington. Damage was widespread in Goshen, Torrington, and Harwinton and was likely due to RFD winds in some locations (particularly south) and a macroburst in other locations (particularly north) as the core of the supercell began to collapse. 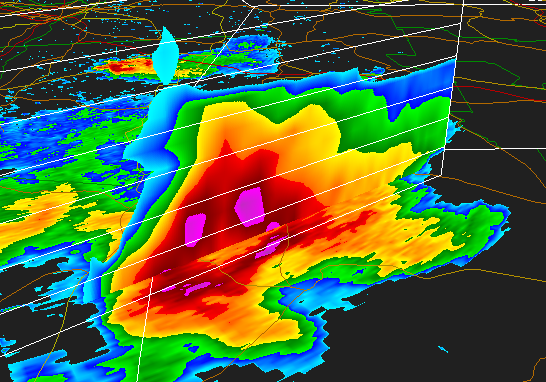 ENX 0.5 degree base reflectivity and base velocity showing low level mesocyclone and hint of an RFD? Not shown is the elevated hail core of the storm descending as storm enters Torrington. 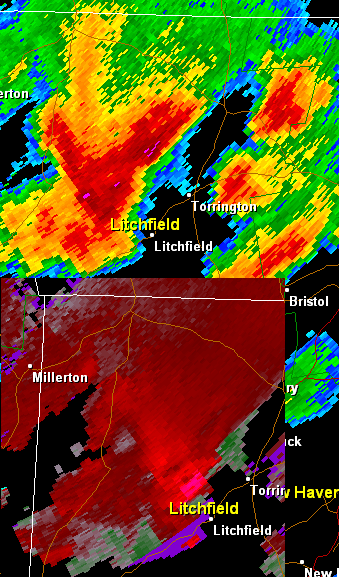 The second supercell of the day developed in Manchester and quickly split like the Litchfield County storm. The left mover produced a macroburst in Tolland that was easy to see on radar as the core collapsed, while the right mover hung on for a while doing damage in Willimantic and Scotland before falling apart. 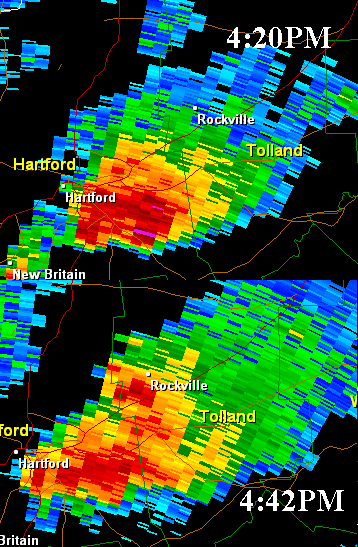 OKX 2.4degree base reflectivity (16-18kft over Tolland County) showing the 2 updrafts splitting over Manchester. The left mover moved well left of the previous storm motion and right mover jogged ESE. The storm split occurred between 4:20 p.m. and 4:30 p.m. and by 4:42 p.m. you can see above two distinct updrafts both producing hail and wind damage. It appears that downbursts/macrobursts occurred in both storms moving in very different directions. It’s not the best time of year for a heavy rain event, smack in the middle of the July 4th holiday weekend, but it appears there’s the potential for some torrential downpours tomorrow. A cold front will approach from the west and a significant amount of moisture will stream north. In addition, very weak winds from the ground up through 35,000 feet, will result in very slow movement of thunderstorms that do develop. 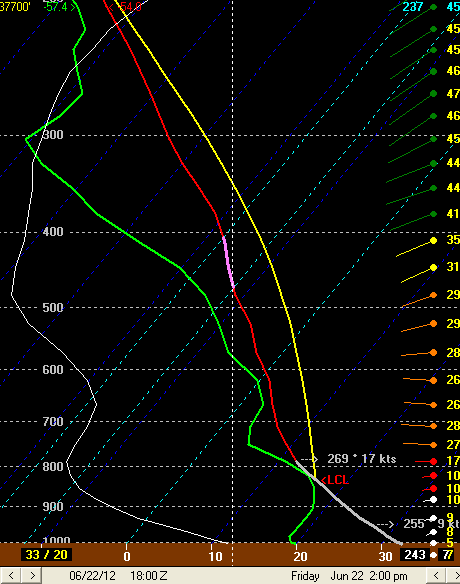 Here’s a 18z NAM BUFKIT forecast sounding from BDL. Ingredients for heavy rain are there with instability, large amounts of moisture, and weak steering flow. If numerous thunderstorms are able to form along a stalled surface front there is a risk for flash flooding in some locations. Not every town is going to see big downpours tomorrow but some certainly will. 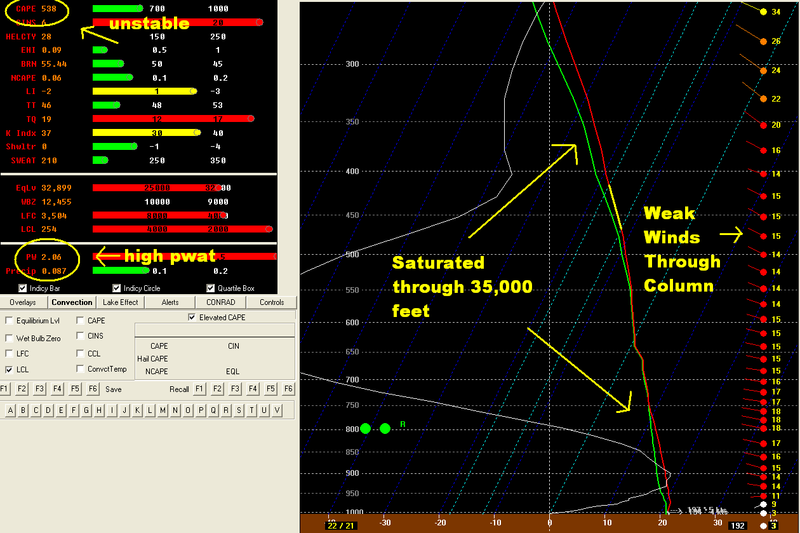 Severe weather will not be widespread with little wind shear and only modest instability. If the instability winds up being more impressive than currently forecast (steeper mid level lapse rates and/or more morning sunshine) than there is the risk for pulse severe thunderstorms producing downbursts. On June 24, 2010 around 2:30 I was stuck on the tarmac at Newark Airport waiting to fly to Seattle. There’s no worse place to be for a Connecticut meteorologist when a tornado is tearing through Bridgeport. The storm wasn’t a classic supercell like we saw 3 weeks ago in Massachusetts. Like the Woodbury tornado 2 weeks ago and then Bethel/Newtown 2007 tornado this one was a quick spin up on the leading edge of a downburst/bow echo. The rotation was very difficult to see on radar yet the National Weather Service was still able to get a tornado warning out about 13 minutes before the touchdown. Very impressive! The storm was only on the ground for 0.15 miles but did a substantial amount of damage near downtown and I-95. The associated downburst resulted in widespread damage through eastern Bridgeport and the western portion of Stratford including a 78 mph wind gust at the KBDR ASOS.